Here’s a peek at our Christmas table from today’s lunch. 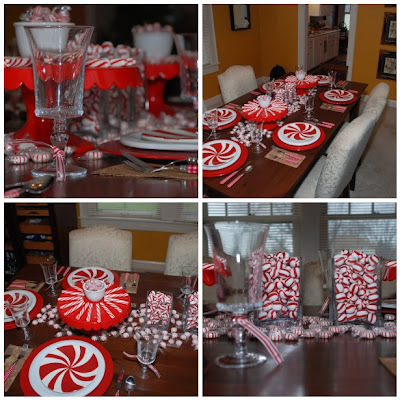 It was a quick and easy set up with peppermint candies as decor. I filled vases with peppermint balls, scattered peppermint discs along the middle of the table as a runner. Red & White gingham flatware, red charger plates, white dinner plates and peppermint salad plates finished off the look. Merry Christmas!! This entry was posted in Christmas Candy, Peppermint Party, Red White Party on December 25, 2009 by Setting the Mood.